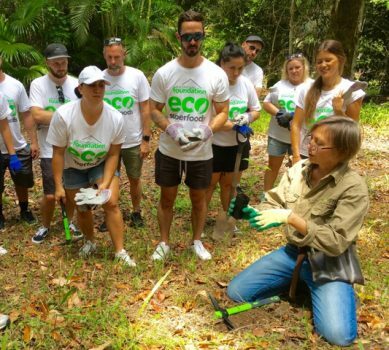 Merry Christmas Eco Super Foods Team, brilliant to have you contact us to follow up on the developments from Eco Super Foods bush regeneration and tree planting outdoor team building day in the Gold Coast Hinterland rainforest. The energy and enthusiasm of Eco Super Foods staff and employees putting the love of labour in was exceptional. Over 100 plants planted, 1 acre of invasive weeds removed. Which is key in making conservation a priority and investment for future generations. The dry weather spell throughout March – October 2018 impacted approx 25% of the transplanted plants. However in perspective, a success of 75% is environmentally exceptional. News since then is that further assistance to regenerate this special Gold Coast natural habi tat has just been granted. Yahoo! The Office of the Mayor Tom Tate – City Of Gold Coast has written (in fine gold print) re NCAP Grant. “Congratulation on receiving funding through this years Nature Conservation Assistance NCAP Program. It is important that we recognise that with over half the city’s native vegetation located on private land, you play a crucial role in helping to manage and protect the city’s natural assets”. The property essentially has been locked up and given to wildlife to regenerate and recuperate through natural processes. With minimal human intervention. Eco Super Foods helping hands, hearts and funding through team building efforts is greatly appreciated. More is to be done. However your input Billy Simmonds, has allowed our team to input a further 200hrs in removal of invasive species of Lantana, Bamboo and other non-indigenous plants to be controlled. With over 150 acres connected to Gold Coast Conservation, there is still much to do in repairing and protecting these rainforest to dry sclerophyll forest environments. Increasing Koala and Native Black Glossy Cockatoo populations as well as native habitats of endangered animals within The Gold Coast hinterland. MORE on environmental team building opportunities.